Two weekends ago I drove from my home here in DC to western Pennsylvania, picked up one younger brother, and then headed to my grandmother’s house in upstate New York. 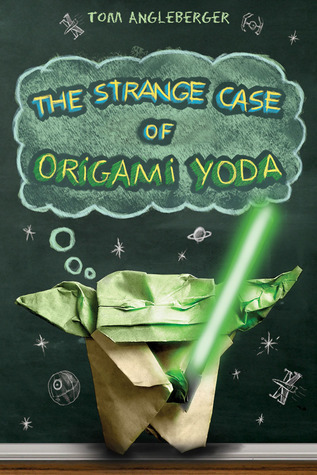 On our way back to DC from that delightful stay, Lincoln (aforementioned younger brother) and I listened to the audiobook of Tom Angleberger’s The Strange Case of Origami Yoda. I, ahem, engineered that little bit of listening time to fit into our trip. Use what you have, right? Our joint thoughts were that it was cute, funny, and entertaining. Tommy and his friends are in sixth grade. They’re doing their best but, well… each is facing his/her own challenges. Most challenged of all? Dwight. Dwight can’t seem to function like a normal human being, and Tommy and his friends don’t know what to do about it. That’s why it’s strange that Dwight’s origami finger puppet of Yoda seems so wise. Yoda gives good advice – but is it because Yoda IS Yoda, or does Dwight have anything to do with it? Tommy puts together a case file to make a final decision – because he needs to know if he can trust Yoda on one specific answer. Angleberger has created a memorable cast of characters in Tommy, Dwight, Harvey, Kellen, Quavondo and Sara (to name a few). Each of them contribute either an interaction with origami Yoda for the case file or comments on the same. Some believe that Yoda has an actual connection with the Force, and others think that Dwight is the one behind Yoda’s answers. The main question that emerges is whether Dwight, socially-awkward Dwight, can have the sort of insight that Yoda possesses. And if so, why doesn’t he use it for himself? WHY is he such a mess? The book is by turns sweet, funny, intelligent and awkward – like real sixth-graders! It will appeal to all ages, and be an especial hit with boys, by nature of the Star Wars references alone. My brother (currently age 23) turned to me at one point and asked “Do you SEE what sixth-grade boys have to go through? !” I was really amused and glad that we could discuss it afterward, and laugh during the listen. A good bonding experience, for sure. A word on the vocal artists: most of the narration was stellar, but Lincoln and I both agreed that Harvey’s ‘voice’ was annoying in the extreme. And possibly that’s as it was supposed to be. Who knows? In any case, it’s a fun listen, and I’d recommend it even to those not usually audiobook aficionados. Recommended for: readers aged ten to fourteen, young Star Wars fans, and anyone who remembers the agonizing days of middle school – and knows they require a healthy dose of humor and patience to survive. I've been meaning to read this one, since it was the Bluebonnet winner last year. So are you an audiobook fan? I've been trying. Liviania: Not sure if I'm an audiobook fan yet. I will say this - it was harder to write the review, because I hadn't re-read the funny bits like I usually do. Had to dig deeper in my memory bank for the good stuff. Also: I don't have a car and don't listen to a whole lot of music anyway, so I don't know how often I'll even be in a position to listen to them. But hey, who knows? I'm an audio afficionado at this point so am always looking for a good audiobook! I will be adding this to my check out list. Plus I am very much attracted to the Star Wars references and the social awkwardness! This sounds outside my usual fare, but lots of fun! O this sounds like such fun. I bet I would dig it. How long is the audio? Juju: The audio is 2.25 hours. Short and sweet (for an audiobook)! Z likes this one quite a bit but I think he will like it more when he's older. Right now he just doesn't get a lot of the older kid issues. Of course I'm totally wishing he never had to deal with them. But I guess your brother's probably right and all 6th grade boys go through stuff!